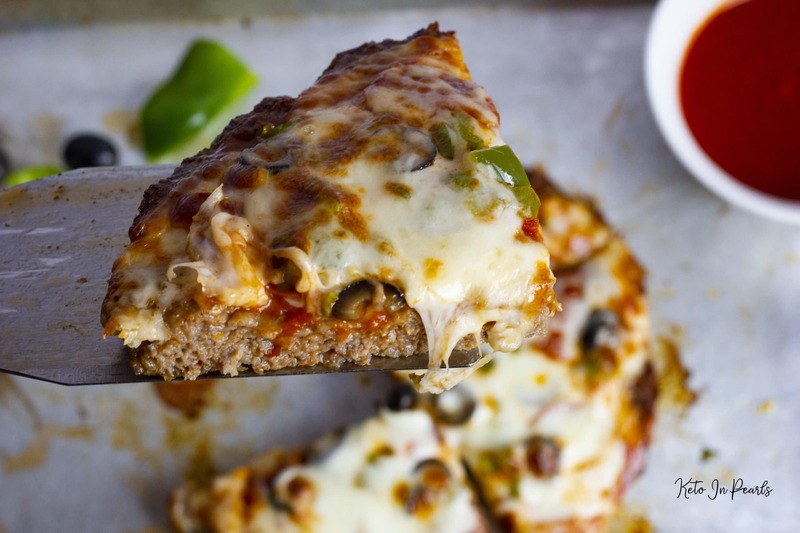 You’ll never miss the bread in this crustless Sausage Crust Keto Pizza! 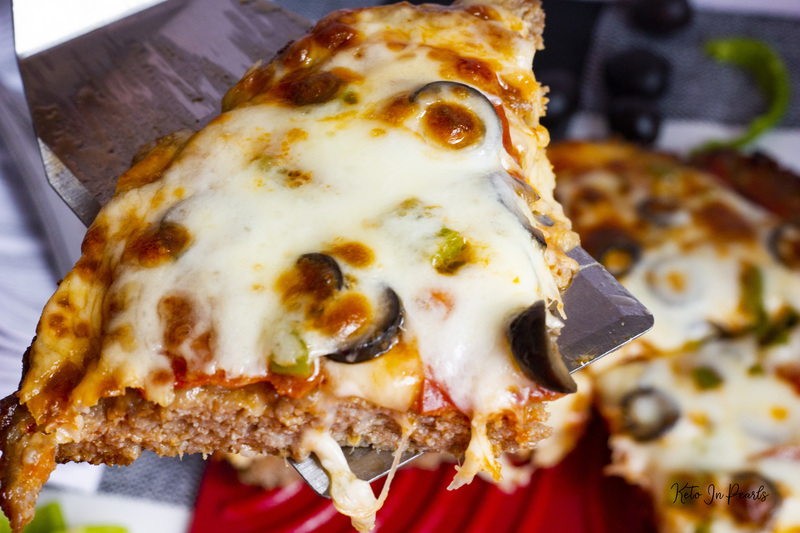 If you’re a meat lovers pizza fan, then you’re going to be singing “it’s amore” after the first bite! This post is sponsored by the Ohio Pork Council rel=”nofollow”. All opinions are my own. It’s gonna be amoré, y’all! What’s your go-to pizza order? Are you a Hawaiian fan? Maybe a veggie kinda girl? Do you like the fancy varieties with spinach, pesto, arugula, etc.? Or do you like the MEATS? I don’t discriminate when it comes to pizza. Part of the reason pizza is so fun (and delicious) is because you can personalize it to fit your mood! 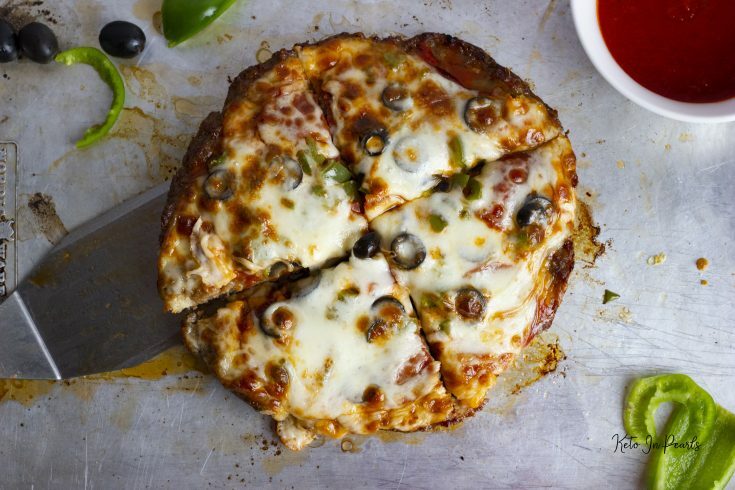 If you think about it, pizza could really be it’s own food group. We need to lobby for an amendment to the official food pyramid and let pizza have it’s own quadrant! YA FEEL?! If you’re in the low carb/keto/gluten free world then you know that meat crust pizzas are all the rage. There’s a really popular brand (who shall remain nameless) of chicken crust pizzas that can be found at grocery stores but they’re REALLY expensive and in my humble opinion, not worth the price. 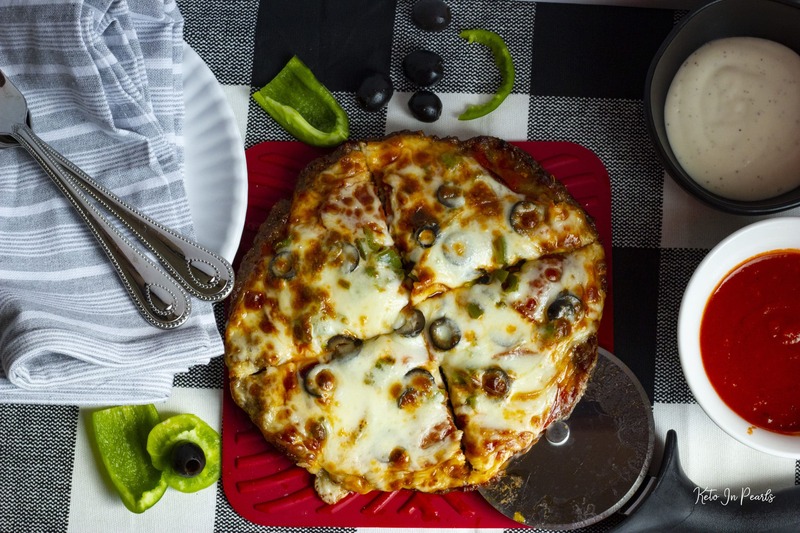 My friend Allie (she blogs over at ABK Living) lives in Chicago and is always raving about this sausage crust pizza she orders from a famous Chicago pizzeria. I don’t live in Chicago and haven’t found any restaurants here in Kentucky that offer something similar but the pictures she shares of this pizza are to. die. for. I had to have some. So, I was searching Pinterest one day and couldn’t find a SINGLE recipe in the blogosphere for a sausage crust pizza. Not one. I was shocked but also, that little lightbulb went off in my head. If I can’t find what I’m looking for then I’ll CREATE it! Y’all, this recipe is insanely easy. So easy that I’m almost embarrassed to call it a recipe. But as my friend Mandee (she blogs over at The Kitchen Wife) says, sometimes you just need an idea for those nights when you’re pressed for time, don’t have much energy, or whatever! Sometimes it’s not about fancy dishes but damn good easy ideas! 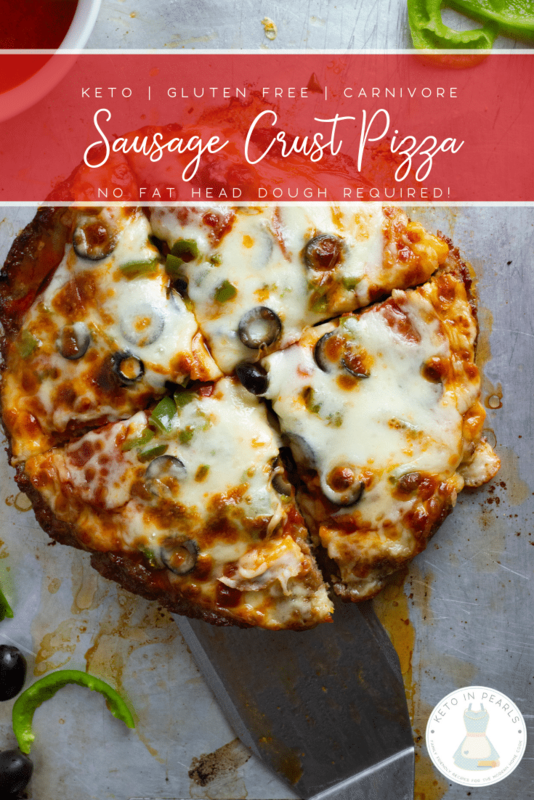 This sausage crust pizza is the perfect alternative for those of you who are nut free, playing around with carnivore, trying to watch your total carb intake, or maybe you just want an alternative to fat head dough. If you are looking for the best fat head recipe, click here for mine! Using Italian sausage really intensifies the flavor and fills you up! Sausage is a great food to hit fat and protein macros without compromising your diet. I’m extremely confident that the non-keto friends and family in your life will love this pizza. Especially those of you with picky husbands like me! Men like MEAT and this keto pizza is ALL THE MEATS! This pizza is personal size and makes enough for 4 people to have 1 slice. 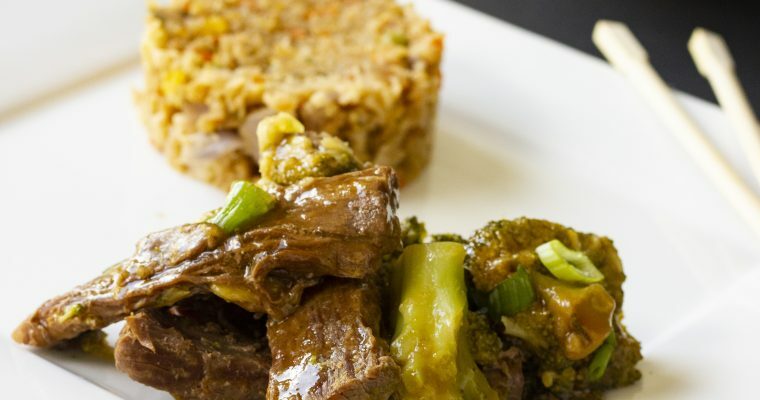 One piece is extremely filling but if your macros all for 2, then go for it! Double or triple the recipe (in separate pans) to serve more people. Make sure to calculate the macros for the pizza you create. Macros will vary with sausage brand, toppings, etc. My nutrition label should be a guide. Make the crust in a cake pan so it will hold it’s shape. The sausage will shrink down some in cooking, which is normal, but it will stay circular. Dab the grease off of the top of the sausage before adding the sauce or it will slide right off. Press the sausage into a round pan 9" cake pan. Make sure the top is level so that the crust will cook evenly. Remove from oven and use a paper towel to dab off excess grease. Transfer the crust to a baking sheet if desired. Spread the marinara sauce on top. Sprinkle the shredded cheese on top. Layer the vegetables and pepperoni. Top with the provolone slices. 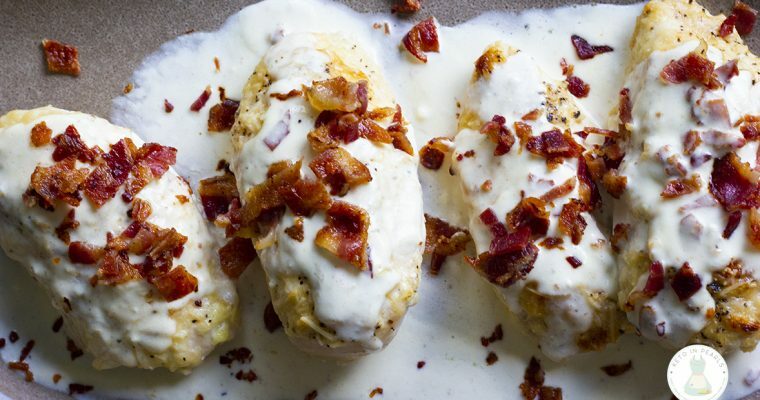 Place under the broiler for 5 minutes or until the cheese is melted and bubbly. Wow! I just found your blog. I love it! Signing up for email. OMG your recipes are A MAZING. 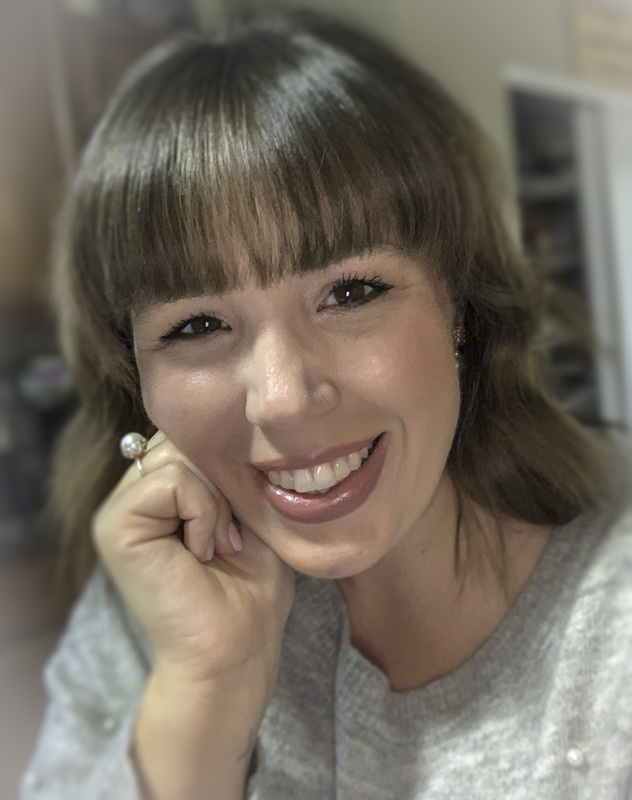 ..
I’m going to go back onto keto, and may not struggle as much after finding your sight.. Thank you so much.. 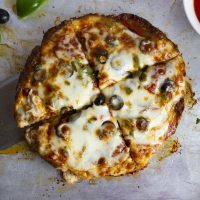 The hardest thing about Keto for me is finding good recipes this sausage pizza looks amazing can’t wait to try it thank you .. I had already bought sausage to try a sausage crust pizza. I was looking for a recipe when I found this site. I didnt know if I should mix the sausage with egg or cheese to make the crust. I will follow your directions and let you know how it comes out!